As we noted earlier this week, median home prices in the entire nine-county Bay Area experienced solid year-over-year increases in July, up 24.2 percent from the same month in 2012. All six counties within Pacific Union’s Bay Area region also saw double-digit price spikes, with Sonoma County seeing price gains of 34.3 percent. But within those individual counties, home prices in some places are showing larger increases than those in other areas. To find out which cities and districts in the Bay Area have seen the largest year-over-year median sales price hikes, we dug into MLS data to assemble a top 10 list. Note that these figures were valid for single-family homes as of August 20, and that our list includes 11 cities and districts to account for a tie in the 10th position. The Sonoma County city of Healdsburg, where home prices have increased 36.8 percent in one year, tops our list. Home prices hit $830,000 in July 2013, up from $525,000 a year earlier. Rick Laws, branch executive of Pacific Union’s Sonoma County offices, believes that some of the hike could be due to the relatively smaller number of sales in the city of 11,000. “If you have a handful of $5 million to $10 million sales in Healdsburg, it would skew the numbers, whereas that wouldn’t happen to the same degree in Santa Rosa,” Laws said. Additionally, it is worth noting that sales of million-dollar-plus homes in Sonoma County have increased 176 percent over the last two years. Healdsburg’s second-home market has likely received a lift from that dynamic, said Laws. San Francisco’s District 3, which includes the neighborhoods of Lakeside and Stonestown, saw the second-largest year-over-year price gains, at 31.5 percent. 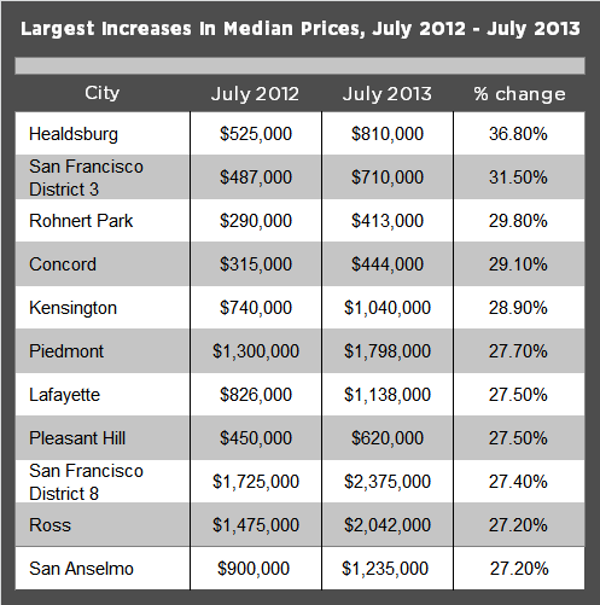 The median home sales price in the district was $710,000 in July, up from $487,000 a year earlier. Sales prices in District 3 actually hit their two-year highs in May, when they topped out at $840,000. Rohnert Park, also in Sonoma County, was No. 3 on the list, with year-over-year price hikes of 29.8 percent. Sales prices hit their two-year peaks in July at $410,000, up from $290,000 a year earlier. Laws attributes the increase in prices in the city to lower levels of distressed homes on the market, and thus fewer sales. “That was an area of significant distressed-property sales, and now there are less distressed home sales in Rohnert Park and more equity sales,” Laws stated. Rounding out our list are three cities in Contra Costa County, two in the East Bay, two in Marin County, and another San Francisco district. See the chart below for the full list and figures. Previous PostPrevious West Oakland Renaissance: Can Investors Help Neighborhood Overcome Blight?